Steven Joel Sotloff, (5/11/1983-circa 9/2/1014) May God avenge his blood. 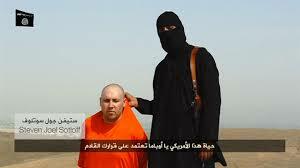 Another American journalist, Steven J. Sotloff, has been heartlessly beheaded by the agents of ISIS. Having just read about this, my desire is to see the perpetrators and their henchmen bombed into oblivion, imagining them crawling along the desert floor seeking a hole to hide in from the terror that is raining down upon them, and finding none. Was I being spiritually derelict for harboring such thoughts? I think not. There is plenty in the Bible about a longng for God’s judgment upon such wicked people. This is not a longing for revenge, it is not a blood lust, but what we might call “justice lust.” And it is right, and beautiful, understandable, and good. “The wrath of the Lamb,” what an arresting phrase! The One who came to live a sinless life and who died on a Roman gibbet, a despised Jew, naked and apparently powerless before the savage brutality of Rome, the one who came to demonstrate invincible power in manifest weakness, who took the worst that evil can dish out, and triumphed over it all in his resurrection, this one, the Lamb of God, will return to mete out the judgment richly deserved by the truly evil–those who gloried in their ability to get away with it all. There will come a Day when there will be no place to hide. None. Are we wrong to long for that day? No more wrong than those who cry out from beneath the throne of God. We do not glory in the doom awaiting the truly wicked. But it is satisfying to know that their unspeakable evil will never be the last word on the matter. The last word for those who despised mercy and goodness and powerlessness and gentleness, for those who drove in the nails, and who grab the hair of terrified victims as a handy handle to assist in cutting off their heads, the last word for such people is the Wrath of the Lamb. And there will be no place to hide. For all of us the most colossal struggle is as it was for Jonah, who fled from the presence of God rather than be the agent of God’s mercy for the hideous Assyrians, the ideological mentors of ISIS. Ours is a struggle to find in God the will to wish that even such as these might find the mercy none of us deserve. Right now, I am with Jonah, fleeing from the presence of a God who would show mercy to such beasts. Shalom Rabbi …. You have captured the wickedness of today’s Middle Eastern World with boldness by saying what many are perhaps thinking but Political Correctness has prevented such words to escape their lips! I weep for the families of the slain and yes, there will come a time when the Holy One, Blessed Be He…will render judgement. Woe to those who do not tremble! Thank you for your words, shedding courage and strength on us all. May the Sovereign Lord bless and protect you all the days of your life. I shall paste this article in my prayer journal – and share it with others – for it gives us direction on how to pray and live out these days. May God bless you very mightily. I continue to sit daily at the dining table that once belonged to your family… it reminds me of your calling. Just found out Sotloff was also an Israeli citizen who fasted on Yom Kippur while being held captive. ISIS is NOT the Amalekites, a different genetic/cultural group. Nowhere did I say that. They ARE in the same geogrpahic area as the Assyrians were and are using the same horrific terror tactics as they. They are not simply Islamic extremists, but are channeling a level and tactics of barbarity that go back a thousand years prior to Islam to pagan Assyria. I DO believe they have crossed a threshhold of inhumanity that calls for prayer by God’s people, for divine judgment, and for unambiguous and decisive counter measures. This is a virulent moral/cultural cancer that must be dealt with decisively. The nations of the world know that there are boundaries even in the conduct of war. There people have transcended those boundaries and the nations of the world need to act accordingly.